J'avais la date depuis longtemps mais j'avais déjà dû entendre des bruits sur le prochain album de B.B. et donc des concerts prochains. Mes congés étant limités et ne pouvant choisir un emplacement à mon goût à ce concert par internet, le choix a été vite fait : B.B.! Je viens de relire le sujet et je m'aperçois que tu l'avais indiqué depuis un certain temps déjà ! La Disparition reste pour moi le plus bel album de K-A. Voila une nouvelle qui devrait ravir tous les inconditionnels de la chanteuse Keren Ann et de l'Islandais Bardi Johannsson, l'instigateur du projet électro-pop Bang Gang. Les deux artistes sortiront physiquement et en digital un nouvel album le 31 août prochain sous leur nom de scène Lady & Bird. Et pas n'importe quel album ! Il s'agira d'un opus né de l'enregistrement de leur concert donné le 5 juin 2008 en clôture du festival Artfest à Reykjavik en Suède. Lors de ce spectacle, ils étaient accompagnés par le célèbre orchestre Iceland Symphony Orchestra, une formation classique de 80 musiciens, dirigé par Daniel Kawka. Considéré par les deux musiciens comme un véritable album plutôt que comme un simple enregistrement live, ce nouveau disque s'appuiera sur des titres de Lady & Bird et sur les répertoires respectifs de Keren Ann et de Bardi Johannsson, réarrangés par Thorvaldor Bjarni Thorvaldsson. Il contiendra notamment une nouvelle version du titre Forward & Reverse, déjà en écoute sur le MySpace de Lady & Bird . Tiens, toi aussi tu es abonné à la newsletter K-A Lili? As-tu téléchargé le titre Forward and Reverse? je 'nai pas téléchargé , keren en anglais ça passe pas trop par mes oreilles toi tu l'as téléchargé ? Non je n'ai pas téléchargé, je ne sais plus pourquoi (je sui trop fatigué) : payant, trop compliqué ou trop indiscret quant à l'internaut? Je ne sais vraiment plus. Keren Ann et Doriand ont composé, écrit et réalisé 11 titres en Français pour le nouvel album d'Emmanuelle Seigner qui s'intitule "Dingue". Très intéressant. Affaire à suivre. Merci Vivi! Le nouvel album d' Emmanuelle Seigner est composé par Keren Ann et Doriand. Moi aussi. J' On est loin. Je me rappelle d'une mise en scène très poétique de Décrocher les étoiles sur la scène du zenith de Caen où le musicien qui faisait les claviers mimait la cueillette des étoiles au-dessus de la tête de K-A. C'était vraiment une très jolie scène. Je me rappelle d'une mise en scène très poétique de Décrocher les étoiles sur la scène du zenith de Caen où le musicien qui faisait les claviers mimait la cueillette des étoiles au-dessus de la tête de K-A. C'était vraiment une très jolie scène. je ne pensais pas qu'elle la faisait en live ! elle la chantait seule ou en duo avec un autre ? Je ne me rappelle pas du tout un duo. Elle chantait seule. I am very much looking forward to your upcoming album as Lady & Bird, your collaboration where Keren Ann is Lady and Bardi is Bird. Your melodic, delicate, yet stunning self-titled debut album from a few years ago goes on a subtly thematic journey (about the flight and fall of two children trapped in the bodies of adults) that is both delightful and dreamy, as well as melancholic and possibly tragic. From what I’ve read, your new album as Lady & Bird is a recording of a concert performed with the Iceland Symphony Orchestra in Reykjavik in 2008. Can you go into more detail about the album, like if it’s a direct recording of the whole concert, or if only certain songs were chosen for the album, and what the album title is? 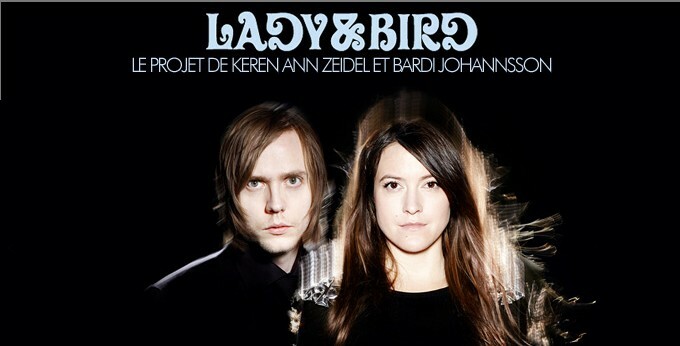 Lady & Bird: The title of the album is quite long “La Ballade of Lady & Bird: a project by Keren Ann Zeidel and Bardi Johannsson.” It contains a selection of songs from a concert we performed in Reykjavik with the Iceland Symphony Orchestra and a choir. “Forward & Reverse” is the first single from the album. At the concert we performed songs from our careers separately and together as Lady & Bird. And since it was a joint concert…. it became a Lady & Bird concert. DOA: What had to be changed in order to go from a studio-created (or acoustic-based) song to performing with an orchestra? Did you have to rearrange or develop song structures in order to format them to the orchestral setting? 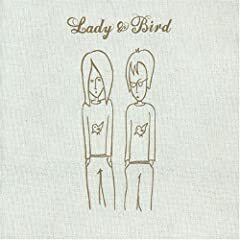 Lady & Bird: We hired an arranger to arrange the songs for an orchestra. In general most of our songs separately and together are quite orchestral and choir-friendly. DOA: What is it like to have the full symphonic splendor of an orchestra behind you while performing live? Is it more intimidating or exhilarating than playing an acoustic set of songs? Bardi: It was the first time I stood on stage as a singer. Heretofore I at least can hide myself behind the guitar. My biggest worries were that I forgot to zip up my fly and I would walk on stage with an open fly. Normally you cannot see it when there is a guitar hiding this part of your body but when you stand defenseless in front of people at least you want to keep your cool. Keren Ann: It felt different because usually by the time I go on stage I’ve had a few drinks and this time since everything was written and measured I didn’t want to lose focus. The hardest was to sing and not hold a guitar. I didn’t know what to do with my hands. DOA: Why did you choose to commit that specific concert to record and not other shows? Lady & Bird: We wanted to release this concert because it is special and good. Generally we think “live albums” are boring and give you a bad version of the originals. With this record we are really adding to the originals and giving something more. Here we had over 90 musicians on stage so we have the power to keep it epic and sometimes add more to the songs than on the originals. DOA: Speaking of live performances, it must be difficult to plan tour dates with each other since Lady & Bird is an on ‘n’ off project per se and not a band. Has it been easy to decide when to play as Lady & Bird or has it impinged upon your other work? Bardi: We don’t play very often so it is for special occasions. We like to keep our performances special and unique. Nothing about Keren Ann is difficult. She is one of the best persons living on earth. Keren Ann: It has never impinged upon our respective careers because making music together is such a privilege. When I don’t see Bardi I miss him so much. There is no one I’d rather work with and I never have enough of him. I always look forward to our collaborations. DOA: From what I understand, Lady & Bird will be performing in Paris on October 27th. Where will you be playing and will you be backed by an orchestra? Lady & Bird: We will play in Salle Pleyel, a nice concert hall in Paris. We are performing with Orchestre Lamoureux and a choir of 12 Icelandic girls. DOA: When did you first meet up with each other? Was it around the time Bardi was recording Something Wrong in 2003? Lady & Bird: We met in a bar in Paris in the year 2000 and decided to try working together. Then we repeated that a couple of times and had some results. DOA: Lady & Bird is one of my all-time favorite albums. I love how there is an overall theme, but that the songs can also be taken on their own. I love the calming to melancholic mood of the instrumentation and vocals contrasted with the winsome to disquieting lyrics. What was it like to create this album? Did you share song composition and lyric-writing duties? How did you decide on what instruments to use? What did you do to manipulate the voices of Lady and Bird on the spoken word segments? Lady & Bird: Thank you for the compliment. We started working together on some music and little by little we became Lady & Bird. We tried to become Keren Ann and Bardi but Shepard wouldn’t let us. He said that when we create music together we are Lady & Bird. All the creative process was done under guidance from Shepard. The voices manipulated themselves. DOA: Going into more detail about the album, I find that the engaging melodies, pleasantly gentle to trippy instrumentation and sweetly airy to softly wistful vocals belies the seriousness of the incisive to morbid lyrics that delve into themes of death, the possible meaningless of and fleeting nature of life, and the disconnect between fantasy and reality. Did you start out with these themes in mind, or did they develop over the course of making the album? Lady & Bird: When we started to write songs, we had no specific direction, but we shortly started to realize that we were under guidance of Shepard and he took us into the world of Lady & Bird. DOA: Even the two cover songs on the album fit in with the aforementioned themes, where the lyrics on Lou Reed’s “Stephanie Says” are “…she’s not afraid to die…” and “…it’s all in her mind.” and the lyrics on “Suicide Is Painless” (aka the theme from M*A*S*H with lyrics by Mike Altman) are “…the game of life is hard to play / I’m going to lose it anyway.” Were there any other songs that you were contemplating covering by other artists? Lady & Bird: These were the only songs that Lady & Bird could cover. There was no other option. Can you comment on those interpretations and if these are the themes that you were aiming for on this album or if I’m going too far down the rabbit hole? Lady & Bird: You never go too far down the rabbit hole… but I would not take this album too Bibical. The first interpretation makes sense. DOA: The second song on the album, “Shepard’s Song”, introduces us to Lady and Bird and their plight, with Shepard (a shepherd?) being from the “outside world”. Who did the surreal vocals for Shepard? Lady & Bird: Shepard himself. DOA: On the song “The Morning After” I can’t hear exactly what Shepard is saying. It sounds like “It’s really hard to hear from…” and then it gets garbled. Can you quote the end of the lyrics here? Can Shepard be taken as an angel or a deity, or just an adult figure? Lady & Bird: So you noticed Shepard on the “The Morning After”. Not everyone does. It is on purpose that you cannot hear the whole sentence… he is giving a subliminal message. DOA: It’s also difficult to discern Shepard’s words on “La Ballade of Lady and Bird” because the voice is distorted and in the background. What is he saying? Lady & Bird: No comment. DOA: What is the significance of the fact that Bird cannot fly? Does this mean that he eventually must “fall” into adulthood and not continue to live and dream as a child? Lady & Bird: A bird with no wings cannot fly. DOA: Moving on to your own projects, Keren Ann, I’ve heard that you worked with Emmanuelle Seigner on her new album. Can you spill any secrets about what it was like to work with Emmanuelle and what your contributions are to her album? Keren Ann: I wrote and produced Emmanuelle’s record with Doriand. It was fun making it. Can’t spill secrets, you’ll have to wait for the release (November 7th). DOA: Bardi, you are a multi-talented artist and in recent years you have scored several films and created music for TV shows, radio, and commercials, as well as co-directed a short film called Red Death in 2004, wrote lyrics for and produced other artists, hosted a TV show, and designed clothes. Where do you find the time and energy to do all this? Please tell me that you try to take a vacation once in a while and just relax! Bardi: You can find time when others sleep. The energy is something I was born with… maybe if people would watch less TV, spend less time with their friends and family, sleep less and skip all hobbies…. then a lot of time will pop up. I am planning a long relaxing vacation in my grave. DOA: Keren Ann, how are things shaping up for a new album? Are you currently working on material? Keren Ann: I am now doing a soundtrack for a French film by Benoit Petre starring Jane Birkin, Catherine Jacob & Caroline Cellier. I am mostly producing other singers and writing music for different projects at the moment. Enjoying being home and not on the road. Making a new album would mean being on the road for the year that follows the release and these days I want stay in one place. DOA: Bardi, can you give some info about Haxan from 2006? From what I understand, you recorded this album with the Bulgarian Symphony Orchestra. What was it like to compose songs and work with this orchestra and conductor? Was it any different than working with the Icelandic Symphony Orchestra? DOA: Bang Gang’s Something Wrong boasted a bevy of beautiful female guest vocalists, including Keren Ann on “Forward and Reverse”. The latest album, Ghosts from the Past, was released last year. Bardi, who did you collaborate with on that album? Do you feel Ghosts from the Past is a continuation of the atmosphere and instrumentation found on previous Bang Gang albums, or did you experiment with a different creative process?